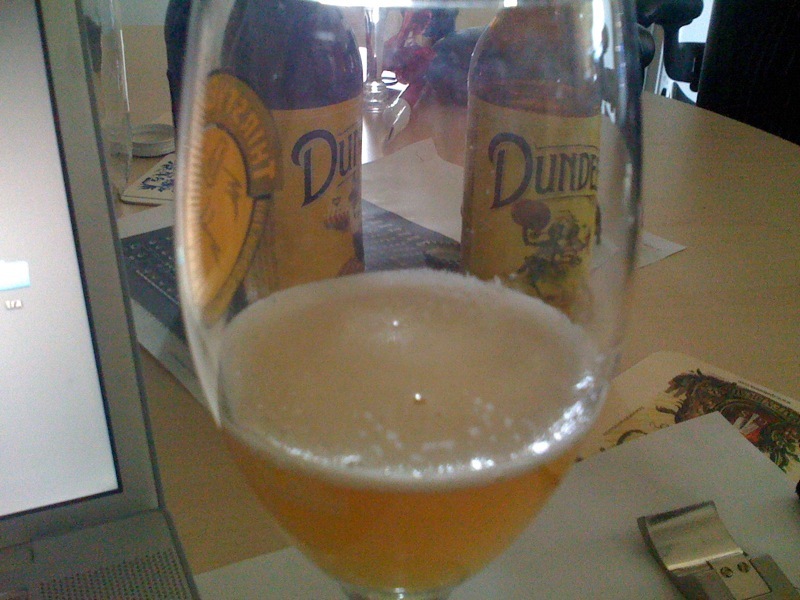 Dundee Brewing was kind enough to send us a sample of three of their beers allowing us to participate in a “virtual tasting” that was held using an online video chat along with a dial in conference call. 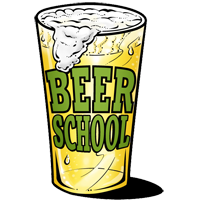 the first question of the day was “can you see me on this video call?” which is pretty funny considering nobody had sampled any of the beers yet. 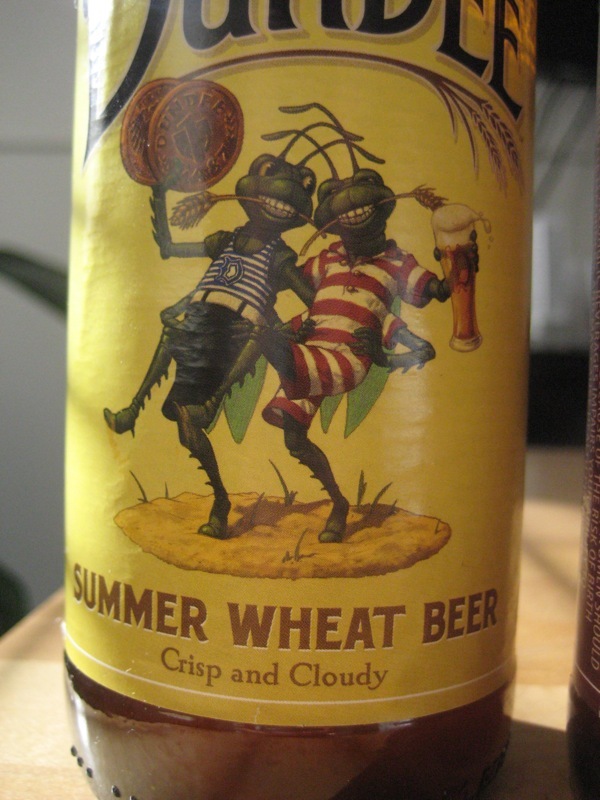 Summer Wheat was great take on what is often considered a bland beer style. what made it different was it’s odd use of hops giving it a citrus flavor without having to add a lemon. those hops include Chinook, Centennial and Cascade. the beer rolls in at 15 IBUs. our first thought was “hey, this would make a great Shandy which is a beer mixed with lemonade. this particular beer would hold up to the lemons very well. we found that if you start with a mix of 75% beer and 25% lemonade you be very happy. taste it before adding more lemonade or more beer for that perfect blend. 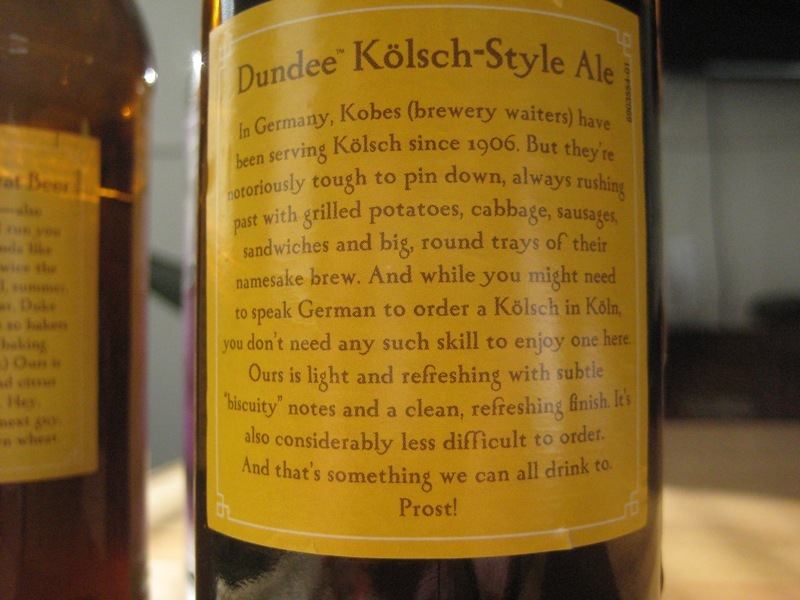 the Kolsch-Style Ale is tough beer to make. it’s not at all heavy and the flavors are almost in the background. you want to enjoy this beer on a hot day from small glasses so your beer doesn’t warm too much. 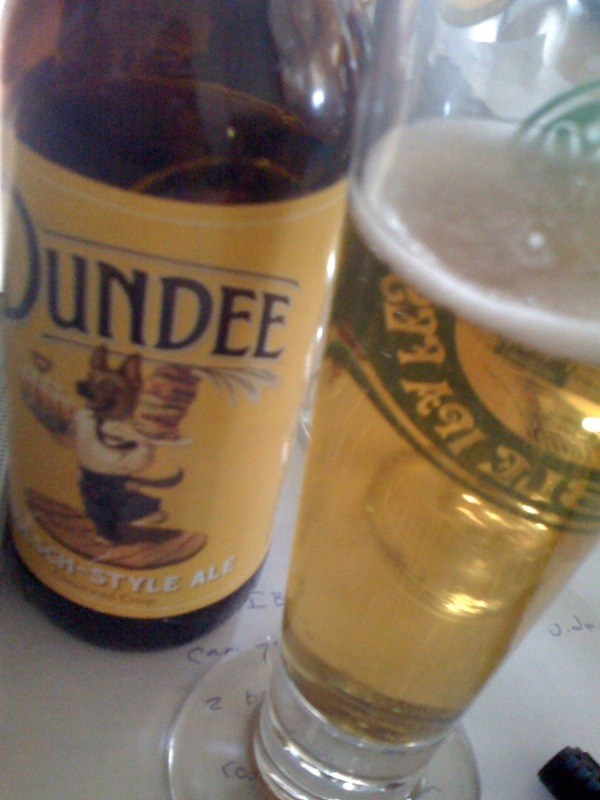 the Dundee example passes the test. although it wasn’t that warm outside. but we did have the correct glassware. 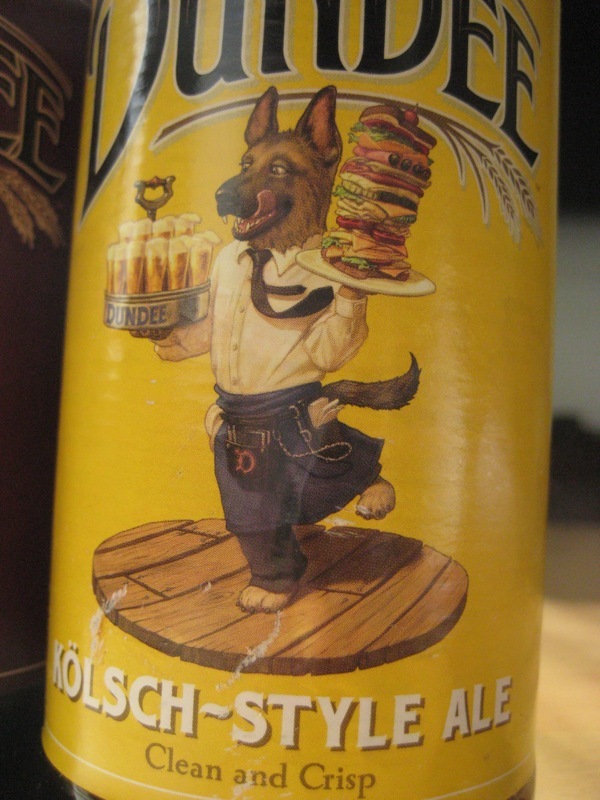 if anything this beer demands to be enjoyed with food like cheese, brockwurst or a single topping pizza. complex food won’t go as well with this simple beer. the Stout from Dundee doesn’t have a bold name like Terminator or Abyss but maybe it doesn’t need one. 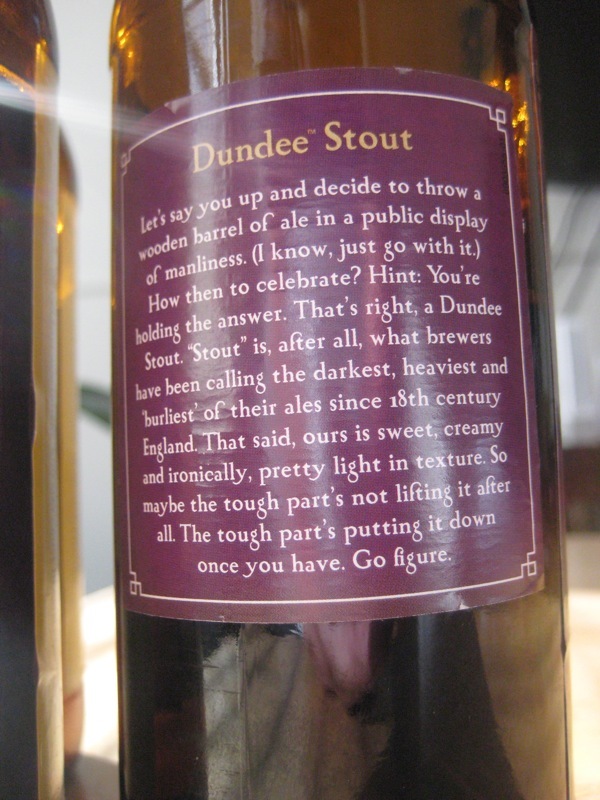 this particular stout has a complex grain bill of seven different malts. the exact blend was not revealed. usually a stout on a summer day is far from the beer you want to enjoy. but we think this might be just the way to end day. especially around a camp fire where you might want something not so light. 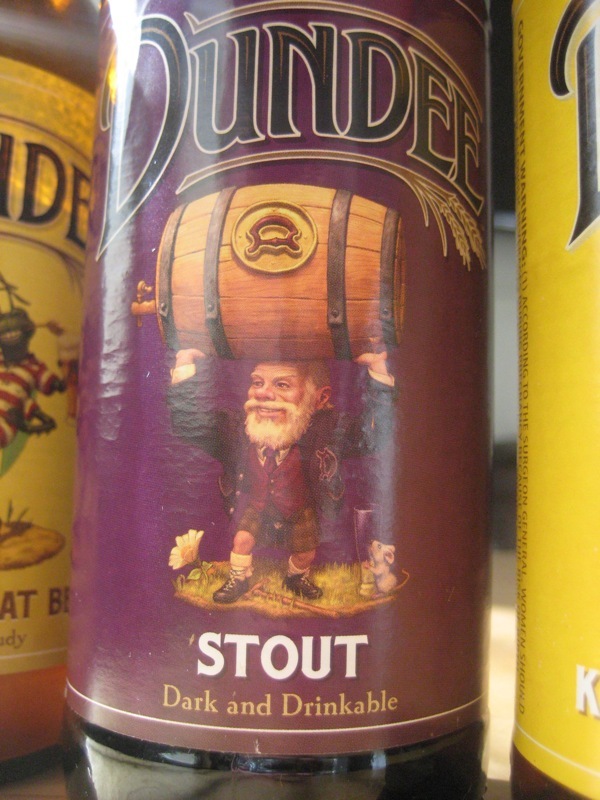 Dundee Stout has lots of aroma, a not so big chocolate and sweet start and it quietly disappears for it’s finish. 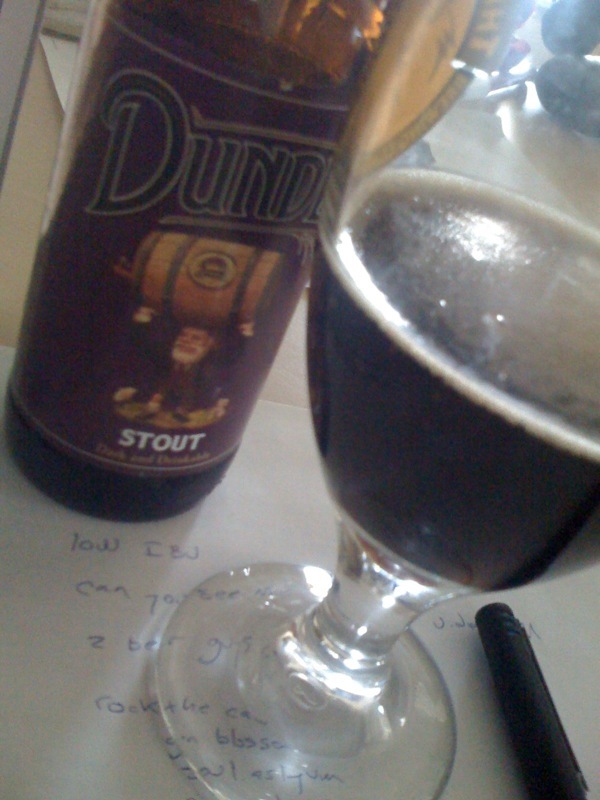 it does not have that usual sour finish that lots of stout mimics. and it certainly didn’t feel thick like the stout you usually drink in the dead of winter. the panel of tasters suggested this might make pretty good ice cream floats. especially with raspberry. and we like the idea of doing reductions with these sweeter not hop’d up beers to put on waffles, pancakes and of course ice cream. 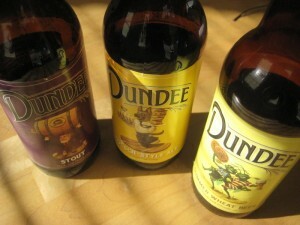 we enjoyed these beers that are obviously made to the liking of the local scene. it’s a change from the west coast style over the over that we usually drink. it’s interesting to note that all of these beers are under 20 IBUs. which might get scoffed for it’s perceived low flavor. 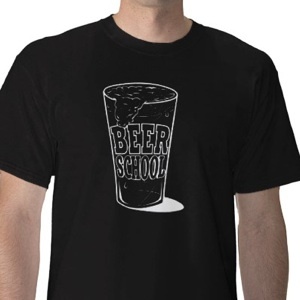 as if you can know what a beer tastes like by how it specs. finally we want to mention the art work on the label. it’s very clever. and it looks fun without being childish. 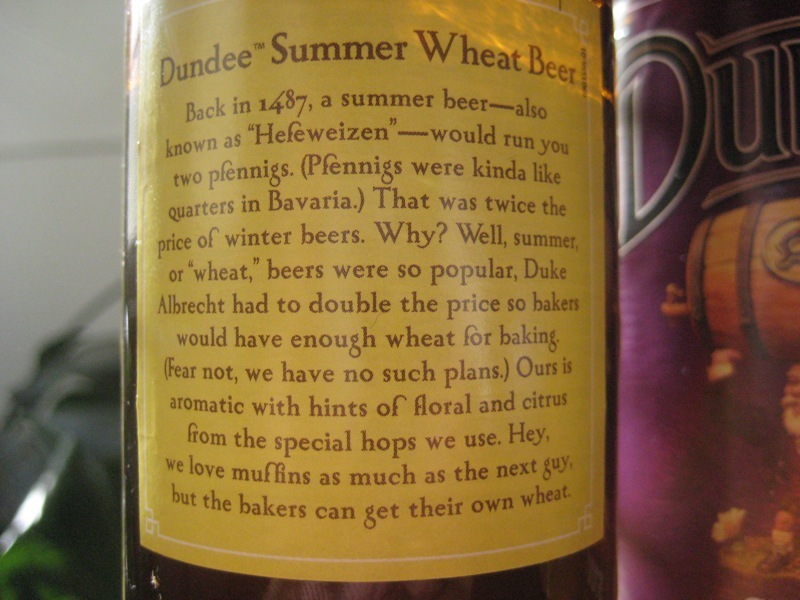 we also like that the brand is supposed to carry itself instead of demanding that the drinker know it’s clever name. there’s nothing wrong with clever names though. 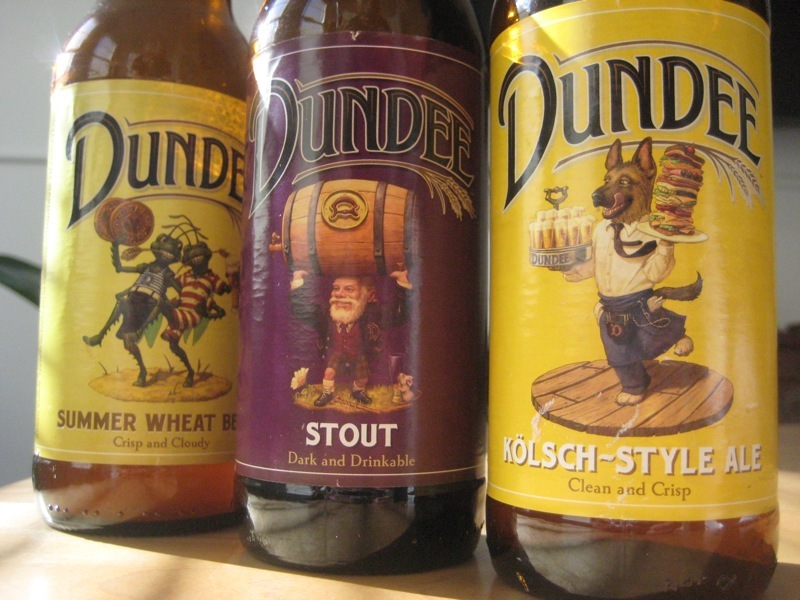 we just like the way that Dundee implemented their package image. 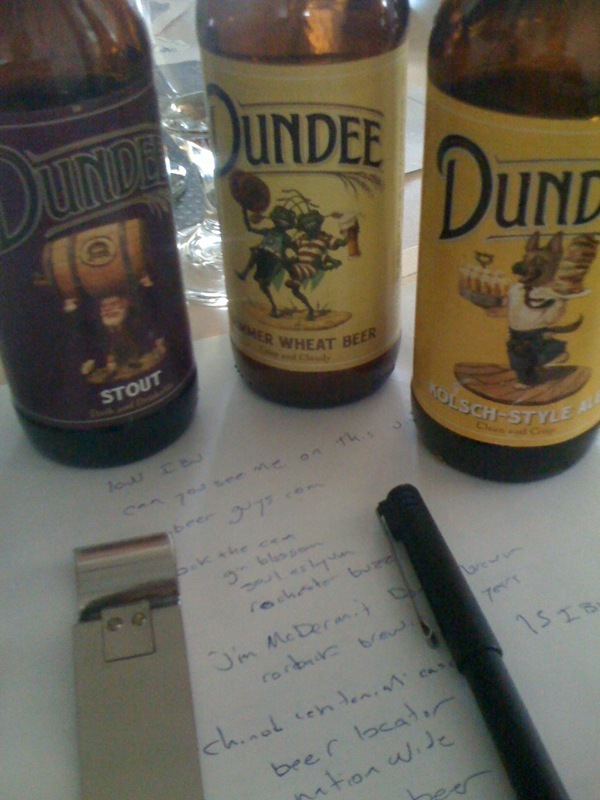 thank you brewer Jim McDermottfor for the talk and the virtual tasting. we still have some beer left so you’ll hear about it on the show soon.